Team – This shortcode was used to display our portfolio’s into various style. Read More – Here you can enter read more text instead of the default text. Team Layout – Here you can set the various layout. Team Variations – Here you can choose a dark or light layout. Team Model – This is an option for team model either grid or list. Team Columns – This is settings for column count. 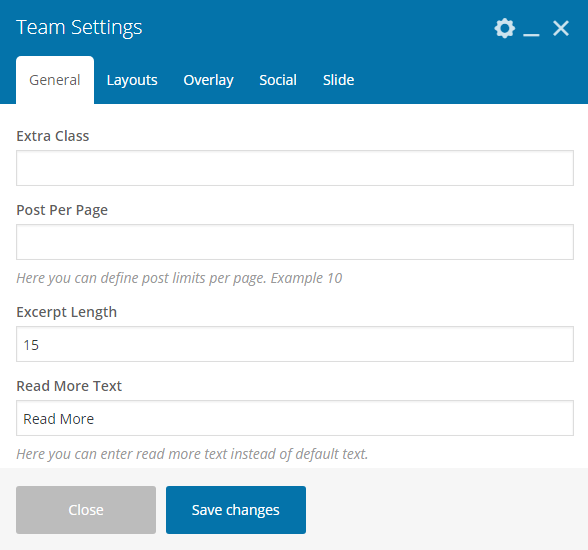 Team Item – This is settings for team custom layout. here you can set your own layout. Drag and drop needed team items to Enabled part. Text Align– This is settings for team text alignment. Slide Option – This is an option for team slider option. Image – This is an option for team image layout either normal, rounded or circled. Overlay Team Option – This is an option for enabling overlay team option. Overlay Font Color – Here you can put team overlay font color. Overlay Link Color – Here you can put team overlay link normal, hover colors. Example #ffffff, #cccccc. Overlay Team Items – This is settings for team items(name, excerpt etc..) overlay on the thumbnail. Drag and drop needed team items to Enabled part..
Overlay Item Position – This is an option for overlay items position. Overlay Text Align – This is an option for team text-align. Overlay Type – This is an option for team overlay type. (Overlay Dark, Overlay White or custom color). Social Icon Style – This is an option for team social icons style. (Circled, Square, Rounded, Transparent ). Social Icon Color – This is an option for team social icons color(Black, White, Own Color). 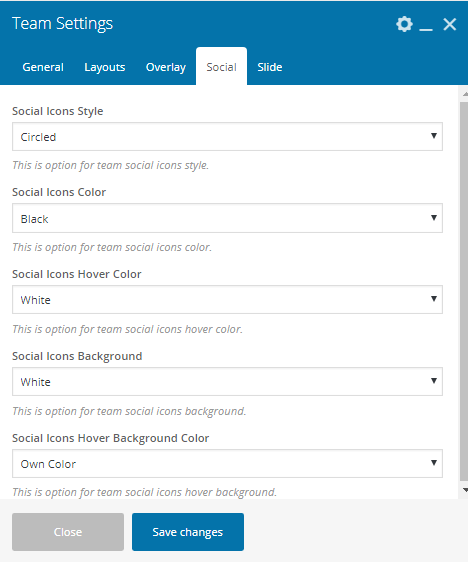 Social Icon Hover Color – This is an option for team social icons hover color(Black, White, Own Color). Social Icon Background – This is an option for team social icons Background color(Black, White, RGBA light, RGBA Dark, Own Color). Social Icon Background Hover Color – This is an option for team social icons Background hover color(Black, White, RGBA light, RGBA Dark, Own Color, Transparent).